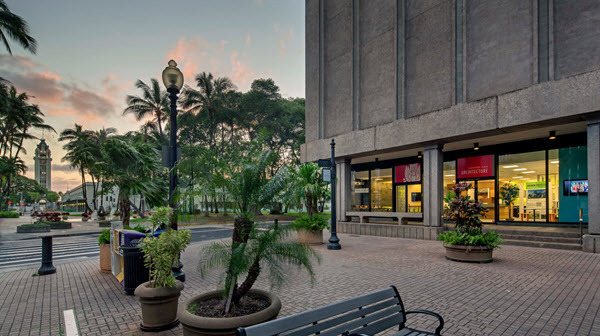 Our Center for Architecture, home to the Honolulu Chapter of the American Institute of Architects (AIA Honolulu), is located in the historic Fort Street Mall business district in downtown Honolulu. This gathering space presents an exciting opportunity for our member architects to connect and engage with professional affiliates, industry partners and the public, in a dialogue, and give them a better understanding how design affects our lives everyday. VIEW OUR RENTAL INFORMATION SHEET! Our space is open to members and the public and we welcome rentals! Special rates available for monthly board meetings - Ask Us! ......all included in one value-added price. Conference Room: Seats avg. 15-18 comfortably. Seats up to 18 people at the conference tables. The room features video teleconferencing capabilities, laptop connections and flat screen TV's for PowerPoint or video presentations. Glass doors are glazed for privacy. Program/Exhibition Space: Seats avg. 30-40 comfortably. Our program space accommodates a variety of set ups such as panel discussions, theater style presentations or training at seated tables. Also great for hosting networking receptions. Kitchen: This is a great staging area for event servicing and clean-up but not intended for meal preparation. Renter responsible for all catering arrangements. See rental agreement for terms. Outside (Lanai): Our storefront space is located on Fort Street pedestrian mall and provides a great setting for attendees to step outside during breaks or for use as an informal lunch break area. March 4, 2013: "Center for Architecture more than just a home for AIA Honolulu" by Jenna Blakely, Pacific Business News. Watch YouTube segement of OC16 Career Changes from Jan. 5, 2013 from the Center for Architecture featuring 2013 AIA Honolulu President, Louis Fung, AIA of Fung Associates and past president Peter Vincent, AIA of Peter Vincent Architects. November 2012: "AIA Honolulu Opens Center for Architecture on Fort Street: You’re always welcome at the new Center for Architecture" by A. Kam Napier, Editor, Honolulu Magazine. November 4, 2012: "Architecture matters now!" by Curt Sanburn, Honolulu Weekly. The Center is already receiving pre-opening media attention and was featured in the Pacific Business News: "Center for Architecture to open in downtown Honolulu. Firm: Geoffrey Lewis Architect, Inc.
Electrical Engineer: MOSS Engineering, Inc. Mechanical Engineer: Engineering System Hawaii, Inc. The winning Center design submitted by Geoffrey Lewis, AIA, of Geoffrey Lewis Architect, Inc., was chosen from among 16 comprehensive entries in a blind judging, by a panel of seasoned and emerging local architecture industry leaders. View Plan (PDF). Lewis’ design is "very engaging from the street” and "maximizes flexibility of the space,” jurors said. Jurors included Laura Ayers, AIA; John Fullmer, AIA; Sam Haagenson, AIA; Frank Haines, FAIA; Clark Llewellyn, FAIA; and Sandi Quildon, AIA, as well as Amy Blagriff, Executive Vice President, as an ex-officio (non-voting) member. Mahalo to the following companies for for their support to the Center build-out.